Durand-Hedden Presents Thunderbird American Indian Dancers - October 25, 2015 ~ The History Girl! Join Durand-Hedden on Sunday, October 25 for an afternoon of dance, history, and American Indian culture. 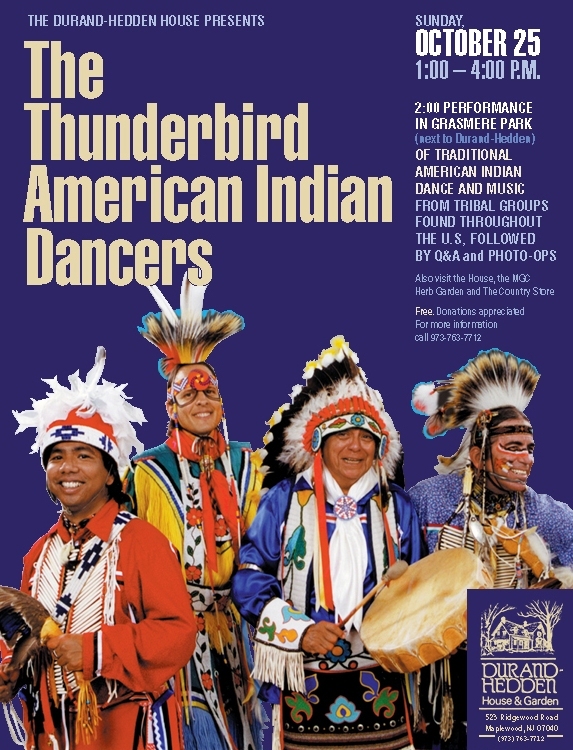 The Thunderbird American Indian Dancers will perform traditional American Indian dance and music from tribal groups found throughout the United States including the Robin Dance, Fish Dance, and Smoke Dance of the Iroquois; the Contest Dance of the Winnebago; the Fancy Shawl Dance; the Old Style Traditional Warrior Dance of the Kiowa and the Hoop Dance.